Swiss Miss Hot Chocolate is a brand of instant hot chocolate made from dark European cocoas. Depending on your nutritional needs or preferred taste, you can find a variety of products under the Swiss Miss Hot Chocolate label, including milk chocolate with or without marshmallows, no sugar added, reduced fat and dark chocolate. There's also a blend of coffee containing chocolate. Of the Swiss Miss instant cocoa mixes, the Diet variety provides the lowest amount of food energy at 25 calories, followed by Fat-Free at 50 calories and No Sugar Added at 60 calories per serving. Dark Chocolate Sensation has the highest energy count at 150 calories. Marshmallow Lovers and regular Hot Chocolate each provide 120 calories per serving. One envelope has one serving. A serving of Dark Chocolate instant cocoa mix has 30 calories from fat, or 5 percent of your daily value if you are on a 2,000-calorie diet. No-Sugar Added and Fat-Free each have only 10 fat calories, while Great Start cocoa mix has 20 fat calories per serving. 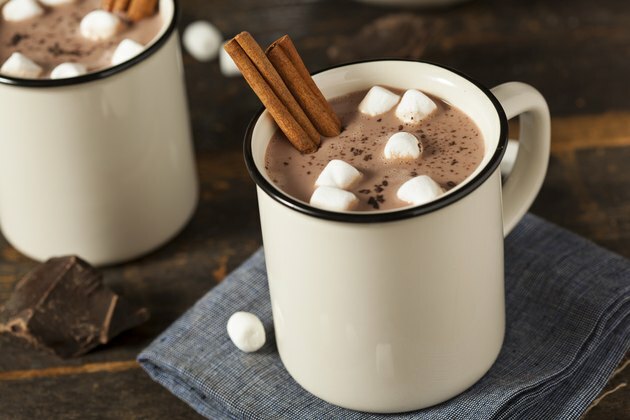 One serving of Swiss Miss Diet Hot Chocolate will only give you 14 calories from carbohydrates, or 1 percent of the daily value for a 2,000 calorie diet. One serving of the Dark Chocolate Sensation version has 104 calories from carbohydrates, or 9 percent of the daily value based on a 2,000 calorie diet. The other varieties -- Great Start, Marshmallow Lovers and Mocha Cappuccino -- have 92 carbohydrate calories in one serving. Swiss Miss Hot Chocolate cocoa mixes have only 1 or 2 g of protein, or the equivalent of 4 to 8 calories per serving. Most of the Swiss Miss instant cocoa mixes provide 30 percent of the daily value for calcium, 25 percent of the DV for vitamin D and 6 percent of the DV for iron. The Great Start cocoa mix contains additional nutrients, including vitamins A, D, B6 and B12, E, riboflavin, thiamine and niacin. The Swiss Miss Pick-Me-Up cocoa has 67 mg of caffeine, as much as a cup of coffee.